Directions: Solve each problem and choose the correct answer. On the first 5 of 6 semester tests, each of which is worth 100 points, a student has earned the following grades: 75, 87, 83, 89, and 94. What score must the student earn on the sixth 100-point exam to earn an average test grade of 89 for all 6 tests? E. The student cannot earn an average of 89. Identify the bottom line. last score needed so that average of 6 is 89? Assess your options. You could sub in the different answers for the 6th test score or you could leave the missing number as a variable. Either way, you need to use the "average formula," which you should definitely memorize. Every time you see the word "average" on the exam, you should immediately think: "average = the sum divided by the number." Let's use that formula to solve this problem quickly and easily. All we have to do now is solve for x.
Hmmm. Since the test is only worth 100 points, can the student earn a 106? Nope. So, our answer is E.
The average (arithmetic mean) of the weights of 26 stones is p pounds. In terms of p, what is the total weight of the stones, in pounds? Identify the bottom line. total weight of the 26 stones = ? Assess your options. You could pick a number for p and then use it to find the total weight or you could leave p as a variable. Either way, you need to use the "average formula," which you should definitely memorize. Every time you see the word "average" on the exam, you should immediately think: "average = the sum divided by the number." Let's use that formula to solve this problem quickly and easily. The table above shows the number of students enrolled at Allenville Middle School from 2005 to 2011. If the median enrollment over these seven years was 789, and no two years had the same number of students enrolled, what is the lowest possible value for y? Note: In the math section of the SAT, you will encounter questions that do not have answer choices. Instead of bubbling in a letter, you will bubble in your answer. These questions are called grid in questions, and you should always guess an answer for them because there is no penalty for getting the question wrong! Read the problem carefully. Review the definitions of important terms. The median is the middle number in a set of numbers. Identify the bottom line. lowest possible y = ? Assess your options. There is only one possible method for solving this problem, and it is demonstrated below. Attack the problem. Whenever you are working with medians, you should start by putting the list of numbers in order. Now you need to determine where y should fall in the list. The problem tells you that 789 is the median, and no two years had the same enrollment, so y must be greater than 789. The smallest that y can be, therefore, is 790. Loop back. Check to verify that you have solved for the bottom line. The correct answer is 790. Each of four people were given a blank piece of paper on which they wrote a positive integer. If the average (arithmetic mean) of these integers is 21, then what is the greatest possible integer that could be written on one of the pieces of paper? Read the problem carefully. Make sure you understand the situation described in the question and take note of important details. The integers written on the pieces of paper are positive, and they are NOT distinct (different), so there could be repeats of the same number. Identify the bottom line. Greatest possible integer (out of these 4) = ? Attack the problem. Whenever a problem asks about average (arithmetic mean), the first thing you should do is write out the average formula. Now, plug in the information you know from the problem. You were given the average and the number of people. Multiply both sides by 4 to find the sum, which is 84. Now, think about it. The four integers written on the pieces of paper all add up to 84. What is the greatest possible number that could be included among those four? Figure out how to make the other three integers as small as possible to leave the greatest possible number left over. The integers must be positive, so each one must be at least 1. Three of them can be 1 because they do not have to be distinct. So, subtract 3 from 84 and get 81. The correct answer is 81. Read the question carefully. Take notice of important information. You need to determine the probability of rolling two numbers that add up to 8. Identify the bottom line. probability that sum will be 8 = ? Assess your options. You need an organized way to keep track of all the possible rolls that could add up to 8. A simple method is to create a table. Attack the problem. Imagine that one of these dice is blue and one is red. Set up a table with two columns, one for the blue die, and one for the red die. These dice have values 1-6 on their faces, so what sets of numbers between 1 and 6 add up to 8? There’s 2 and 6, 3 and 5, and 4 and 4. But you cannot stop there. You could also have a blue 6 and a red 2 or a blue 5 and a red 3. Fill in those values now. To find the probability of rolling one of these combinations, you have to understand probability. You need to find the probability for each of the combinations you have listed on your chart. You are trying to figure out the probability of rolling two numbers at the same time, so you need to use probability rule 1. 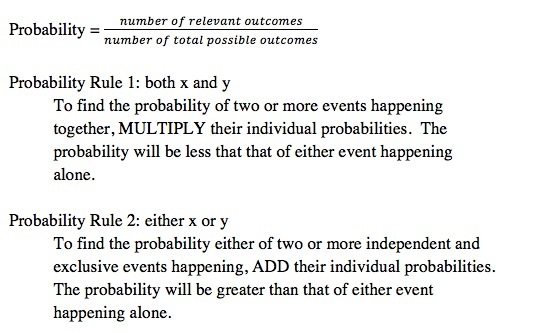 Now, you need to figure out the probability of rolling any of these 5 combinations, so use probability rule 2 and add the probabilities together. Loop back. Verify that you solved for the bottom line and select the correct letter. If the sum of a list of temperatures is divided by the average (arithmetic mean) of the temperatures, the quotient is z. What does z represent? Read the problem carefully. Be sure that you consider the meaning of all the terms in this problem. For instance, it is important to remind yourself that a quotient is the result when one number is divided by another. Identify the bottom line. What does z represent? Assess your options. There are two ways to solve this problem. Your first option is to “think” though the problem in order to figure out what the variable z refers to. Your second option is to pick numbers, which will make the problem much more concrete if you have trouble thinking about mathematical concepts abstractly. The latter option is the easier of the two, so that is the one we will illustrate here. Next, pick two numbers: a larger one to be the sum of all the temperatures, and a smaller one to be the number of temperatures. Pick easy numbers, and make sure that the smaller number is a factor of the larger number so that it will divide in evenly. Let’s use 12 as the sum of the temperatures and 3 as the number of temperatures. If you plug these two numbers into the average formula, the average of the temperatures will come out to be 4. The problem asks you to find the quotient (z) when the sum of the temperatures is divided by the average of the temperatures. Plug in the numbers you have chosen to find the result. The result is 3, which is the number of temperatures. Pick the answer choice that matches with this solution.